Spontaneous combustion occurs about 4 – 14 weeks after baling normally but can occur earlier or up to four months later on some occasions. If the stack heats to excessive levels action is necessary to prevent the possibility of spontaneous combustion. Haystacks should be monitored for heating within days of stacking. If it does heat then monitoring should continue until heating subsides. 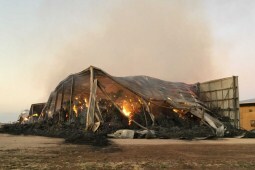 There has already been some hay fires this season. So why have these occurred, and how we can manage this risk in the future? An understanding of the causes of the problem will allow us to be more proactive in addressing the risks. Currently the simple measurement of moisture is virtually the sole assessment of suitability to bale, and likelihood of risk to follow. This can take the form of probes, visual examination or microwave technology to mention a few means. Never the less, even an accurate moisture reading will not be a great guide to all risk of hay heating. As in some previous years, this year moisture alone may not be an accurate means of judging risk. Why is that? The real reason that hay heats and burns is microbial action. Moisture measures are just indicators of likely microbial action. The moisture itself is not causing heat. The heat is a result of oxidation of plant nutrients by fungi, mould and yeast. Bruce Anderson – University of Nebraska- Extension Forage specialist- ehay newsletter May 2008. What has been apparent in similar dry years is a massive water soluble carbohydrate (WSC or plant sugars) level in drought affected crops. This is especially so in cereal crops. Levels in excess of 25% WSC may be common, and levels in excess of 30% are not unheard of. This is probably twice the normal level of WSC that we would see in cereal crops. Nutrient transfer from root mass to seed head is a natural process that occurs every year. In dry years crops may senesce before proper seed head development occurs, with the WSC level maintained in the stem (and leaves to a lesser degree). The reason this is crucial in the context of hay fires is the nutrient source that this provides to the microbial population that is causing our heating. They are able to feast on the WSC, and even at quite low moisture levels are able to survive in a favourable micro environment and cause hay heating. So if we accept that WSC are (along with moisture) another important driver of bug growth and hay heating, what would our risk matrix look like? If the hay moisture level is known to be high due to poor wilting conditions, or rain or heavy dew after baling, the shed should be monitored. Signs of possible heating include steam or condensation under the roof. Check for a caramel or burnt tobacco smell. Smoke indicates the problem is serious! If in doubt about how whether WSC and moisture were OK at baling, monitor the temperature of a hay stack by driving a metal rod into the stack. Leav the rod in it for several hours and then check for warming (see the table below for more details). The metal rod can be left in place for ongoing monitoring or reinserted in other parts of the stack. Note: One hot spot can start a fire and heat development is likely to be uneven across a stack, so the metal rod method can only be used as an indicator. Some people have used a thermometer inserted down a pipe to measure temperature within the stack. This can be effective but risks introducing oxygen into a hot spot, which could then cause ignition. Specialist thermometers with a long probe can be custom-made or thermocouple wire placed in the stack as it is built. Due to the many variables involved in spontaneous combustion it is not possible to be definitive about the temperature at which a haystack is definitely going to burn and therefore should be pulled apart to prevent a fire. Temperature How does the rod feel? What does it mean? Monitor regularly (several times a day), consider safety precautions. Move hay. Most microbes are killed by extreme temperature. Get help! Have water supply on hand before moving bales. Information for this article was sourced from Ian Sawyer, Feedworks and Nsw Industry & Investment (Primefact 716).